Codling moth (Cydia pomonella) (CM) is a major pest of apples in New Zealand. Several biocontrol agents introduced in the past to control CM have only been partially successful at reducing CM populations, so a parasitoid wasp, Mastrus ridens (Hymenoptera: Ichneumonidae), was recently released into apple-growing regions. This study sought evidence of the establishment of CM parasitoids. 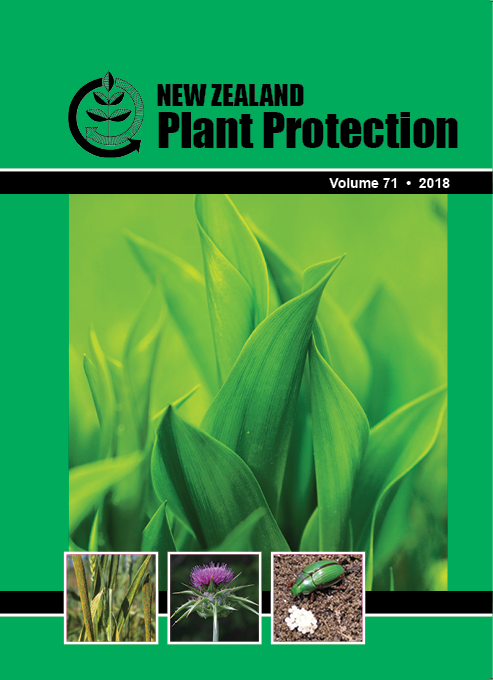 Corrugated cardboard bands (2-cm wide bands with sentinel CM larvae and 10-cm wide empty bands to trap wild CM larvae) were used to assess the presence of M. ridens and other CM parasitoids in Hawke’s Bay, Nelson, Central Otago and Waikato regions. Five CM parasitoid species, including M. ridens, were recovered from sentinel and wide bands. Liotryphon caudatus (Hymenoptera: Ichneumonidae, released to control CM in 1906) was found in Hawke’s Bay and Waikato. Ascogaster quadridentata (Hymenoptera: Braconidae, released to control CM in the 1930s), Glabridorsum stokesii (Hymenoptera: Ichneumonidae, released in 1967 to control light brown apple moth), Dibrachys microgastri (Hymenoptera: Chalcidoidea: Pteromalidae, an accidental arrival) and M. ridens were found in all regions. The interspecific competition between M. ridens and other parasitoid species remains to be investigated.